Arches National Park is situated in South East Utah, pretty close to the Colorado border. Within minutes of entering the park, we figured out that this is a pretty small park and it does not have anything more than a day's activity to offer to a casual visitor. But the park is very picturesque. The snow covered peaks of the La Sal mountains in the background with a reddish Entrada sandstone arches in the foreground make this park a photographer's paradise. Most of the vista points are along the main road or within a short hike from it. Of the hikes, the most well known is the Delicate Arch hike and we spent more time finding a spot to park our car than actually walking the trail. This 1.5 mile long moderately tough hike brought us to one of the well known symbols of Utah, the Delicate Arch. This arch is one of the best spots to enjoy the sunset inside the park. The arch is at its best when the soft evening light of the sun is shining directly on it. If you are planning to spend the evening in this spot, don't forget to take a torch light to help you find your way back without a broken ankle. Another good hike would be the Fiery Furnace hike, named so for its colour and not for its temperature, for which you would at least need a prior booking if not a park ranger as a guide. 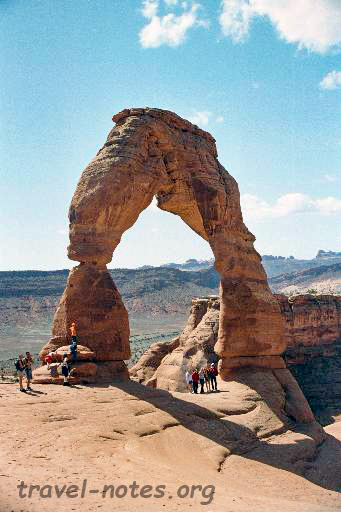 The only other hike of repute is the Devil's Garden hike which takes one to the Double-O arch and its more famous cousin, the Landscape Arch. With a span of 306 ft, the Landscape Arch is one of the largest of its kind in the world and its only serious challenger is the Kolob Arch at the Zion National Park. 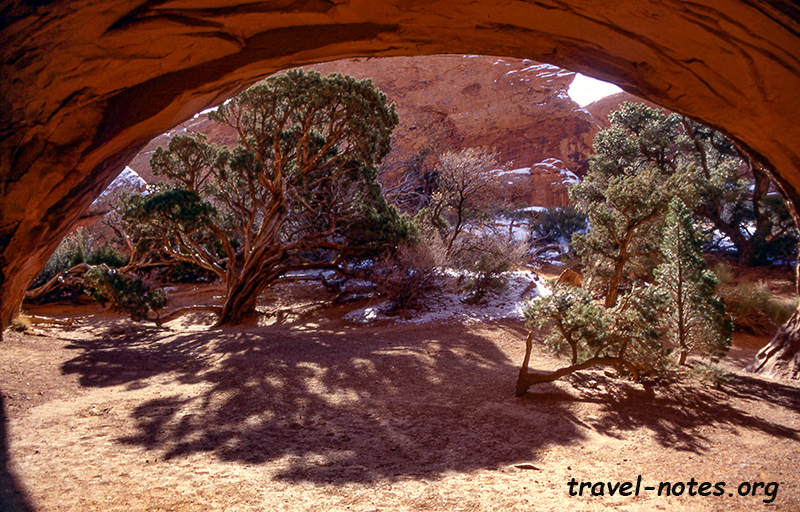 This hike also takes you to many other arches of which the Pine Tree Arch is the most impressive. Among the other formations in the park, the Windows section (where the North and South Windows make a spectacle shaped formation), Balanced Rock and the skyline arch are the must see. The rest are not worth the effort. The formation of an arch is entirely due to weathering and the special qualities of the different layers of rocks found in these region. There is no single universal criteria of determining if a formation is an arch or a window or a hole. By using its own criteria of naming any hole which is more than 3 ft in one direction as an arch, the park claims to host over 2000 arches. But the difference between an arch and a bridge is much more definite as a bridge must be carved by a flowing river. Having finished all the 'must-sees' and 'must-dos' in the park by late afternoon, we started looking for places to spend the rest of our evening. That's when we stumbled upon the Dead Horse Point State Park, named so because one of the pioneers' horse died at this location eons ago due to lack of food. This place can be easily combined with an arches trip in a single day. This park is a must see for all those who don't have the time to spend an extra day at the Canyonlands. 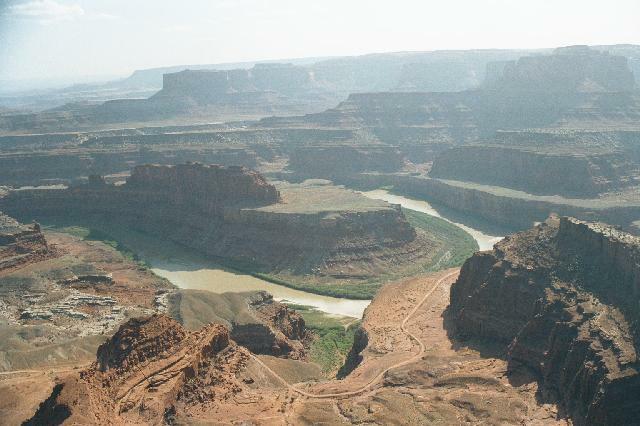 Dead Horse Point is the perfect precursor to the Island in the Sky section of the Canyonlands National Park. The place has the look of the Grand Canyon, much shallower of course, offering a better view of the architect, the Colorado river. It is also one of the best spots to see the spectacular meandering of the river. Moab, the biggest `city' in these parts, is where we spent our nights. It is very nice city with wonderful restaurants and during the week we were visiting, it was also hosting the 35th annual jeepers meet. The city was struggling to cope with the sudden influx of people from all over the country. Crowd aside, the time, mid April, was the perfect time to visit the place. The weather was perfect for hiking and other outdoor activities. Click here for photos from the Arches.